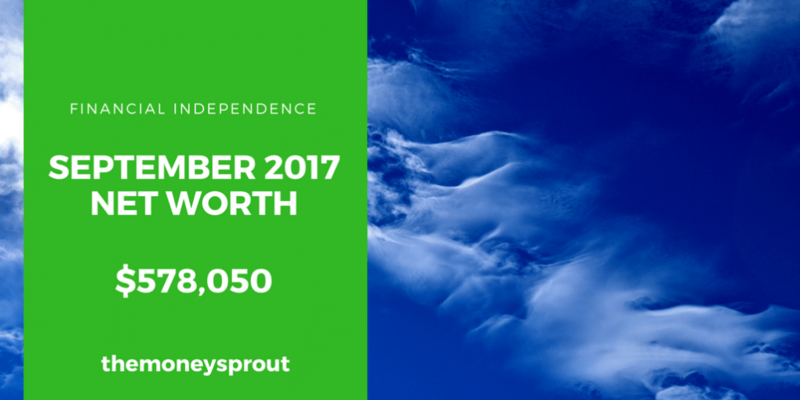 Over 2 years ago, we started tracking our net worth and posted our updates here on The Money Sprout. And in almost every net worth report that we published … our net worth has grown. Well, it is that time again to post another monthly net worth update. And you know what? … we had another monthly increase in September. It was a much larger increase than last month. So far for 2017, we have pitched a shut out (so to speak) by posting a net worth increase each and every month. For the 9th consecutive month (starting in January of this year) … we have grown our net worth. Since first reporting our net worth over 2 years ago in March 2015, it has grown by 32.9%! That is an increase of over $143,000 in just 2+ years. It is an awesome feeling knowing we are growing our net worth by thousands and thousands of dollars every single year! Since first reporting our net worth over 2 years ago … we have seen our assets really grow, while at the same time most of our liabilities decrease. When you are building wealth and growing your net worth … that is exactly what you want to see. Grow your investments (i.e. assets) while lowering your expenses (i.e. liabilities). If you can continue widening that gap (difference between liabilities and assets), there is more money leftover to buy assets and less money to pay for liabilities. Now on to our latest monthly net worth update. Before we move on to reviewing our latest net worth numbers, I wanted to point out that we are using our Personal Capital account to do most of the work. We are tracking our net worth through this free account. This tool has made it possible for us to easily track our net worth at a moments notice. I highly recommend checking out Personal Capital and setting up a free account. It is the best tool available to help track your net worth and can even help with your spending. So how did we do this September? As of September 26th, 2017 – our net worth is $578,049.67! In past years, we didn’t want to post net worth updates every month. Instead we opted for posting updates every quarter or so. Since there are so many moving parts to calculating ones net worth, it seemed pointless at the time to go through the exercise every month. But priorities change … and now we plan to provide an update every month. We started providing monthly updates at the start of 2017 and plan to continue for some time. So why did we change our mind? Our focus is now on saving a lot more of our income each month in order to invest it. And by reviewing our net worth once a month, I feel that it will help us stay motivated with our goal to save (and invest) more. Here is our most recent update, compared to our last net worth post in August. Our net worth in September 2017 increased by a good 1.60% compared to August (2017). That is an increase of over $9,000 in 1 month. That is the way I like it … steady and growing each and every month! A high level breakdown of our assets and liabilities are detailed below. We report our net worth with 3 main asset categories that include – investments, cash, and home value. We don’t like to report our automobiles as an asset, so those are only included as liabilities. If we really wanted to get detailed, I should probably start thinking about adding these assets in the future. This category includes our dividend income portfolio, 529 plans for the kids, emergency fund accounts, retirement accounts, etc. It is currently our highest valued asset and we are constantly working every single day to make it grow. Since last October (2016), we have been focused on investing new money into the stock market. We want to grow our investment portfolio – with a heavy focus on growing our dividend income stream. This past month saw another big increase due to the bullish stock market. At some point, I am waiting for the bottom to fall out with a big correction. And while that may cause our net worth to drop a bunch … I will be sitting back waiting to invest, invest, invest! I want to buy awesome dividend stocks on sale at a big discount rather than paying retail or higher right now. The value of our investments increased by 1.98%. Overall, the health of our portfolio continues to look strong as we have built a solid cash flow machine … that grows and grows each month! Our current cash includes all of our checking and savings accounts. We don’t usually carry a high cash balance and like to move it into the stock market to purchase income producing assets. However, it is also important to have some cash on hand in order to cover unexpected expenses. Our cash balance is a bit higher than normal right now. It is harder to find stocks to invest our money in right now, so we are letting our cash balance grow a bit right now. On a side note … we opened up a new Bank of America Checking Account last month to earn an extra $300 in cash back. We received a sign-up bonus offer to open a new account if we deposited at least $4,000 in the account within the first 90 days through direct deposit. We are well on our way to earning that extra $300 … but also had a hiccup that cost us $35! A future post will come later, but moving money around from different accounts cost us an insufficient funds fee. I have never been a big fan of reporting on our home value in our net worth. Many personal finance bloggers don’t report their home value. I have gone back and forth on it. But in the end, it is one of our largest assets so I think we need to include it. We are currently using the Zillow estimate on our home, which is calculated directly through Personal Capital. This asset will likely see a bunch of ups and downs each time I report our net worth. We had a drop of about $500 in our “estimated home value” … which is just that … an estimate. Not a big deal either way. Overall, 2 out of 3 of our major asset classes saw increases. Investments (as usual) really helped to push our net worth higher this past month. The stock market has been on a roar lately and a lot of our increases are a direct result. Total assets rose by 1.07% since last reporting. Overall, a 1% increase doesn’t sound like much, but it is a good chunk of money on $750,000+! There are 3 main liability categories that we will report on. The first and largest is our mortgage balance. Then we have our credit card balances … which is how we pay for almost every purchase we make. The last category is our car loan(s). We just took on more debt back in January, when I purchased a new car. That was a tough decision buying a new car … but one that I feel comfortable with now. One month at a time … we are working to pay down our mortgage debt. Fortunately, we have a reasonable mortgage rate and a monthly payment that doesn’t completely hold us down. We have a 30 year mortgage on our home with a rate of 4.375%. That isn’t too bad of a rate, so we don’t normally pay any extra on the mortgage. However, the past couple of months we started rounding our payments up the the nearest $100. That ends up being an extra ~$21 a month or so that goes directly to the principal. We continued that trend in September by rounding off our payment and putting a few extra dollars towards our principal. Not a huge difference, but if feels good to pay down that debt! Every few months, we consider refinancing to a 15 year mortgage … but the numbers never seem to work out. Note – for every extra dollar we use to pay down our principal … that is an extra dollar we increase our net worth. At the start of the year, we took on a lot more debt after buying a second car … which I will refer to as “car loan #2”. My 16+ year old vehicle finally died, so I needed reliable transportation. The good news is that we were able to purchase a new vehicle that gets over 35 mpg with a 0% financed loan. The bad news is that we took on $17,000+ in debt and a second car payment. As far as our other “family car”, we have a very low rate and are on year #6 of the loan. We refer to this as “car loan #1”. Since our rate on this vehicle is 1.56%, we haven’t paid too much extra on it … up until the past couple of months. We are anxious to get this loan paid off now that we have a second car payment. So for a couple of months, we have been adding extra money to help pay down our principal. Since we are not paying any extra money on our mortgage and our car loan has such a low rate, our credit card spending is the biggest area for improvement. Note – We have always paid our balance off every month on our credit cards. Our credit card balances fluctuate a lot month to month. However, we are really focused on spending less. Note – The balances shown above are at a point in time and don’t reflect the amount we spend in a month. Over the past couple of weeks, we have started to explore how to build up our credit card rewards … specifically earning travel rewards. We have been earning rewards for the past 10+ years on our credit card spending. But we need to figure out how to maximize our earnings potential and take advantage of bonus offers. Since last reporting, our mortgage balance has dropped – as expected. It is good to know that each payment we make, we are paying less and less interest. Because of amortization, each payment we make … the principal drops at a higher and higher rate. We also saw a great big drop in our car loan debt and a slight increase in our credit card spending. Collectively our total liabilities dropped by almost $800 … which is awesome! Growing your net worth is not just about increasing your assets. It is just as important to lower your liabilities at the same time. The larger the gap is between your total assets and total liabilities is the key to financial independence and something my family is working towards. As I like to point out every time we talk about net worth … there are 2 sides to the equation. So a decrease in liabilities by ~$750+ is just as important as increasing our assets by the same amount. For some reason, I actually get more excited now reporting on how we are lowering our liabilities instead of growing our assets. We plan to keep these net worth posts updated every month now, which is a change from the past. After reviewing our net worth number for this September, most of our gains came from our investments … which is no surprise at all. Besides increasing our investments, we were able to lower our liabilities by another $700+, which helps just as much as increasing our assets by the same amount. In addition to lowering our debt, we were able to save a little more money last month and bump our cash balance up. Do you track your net worth? What steps are you taking to widen the gap between your assets and liabilities?